When everyone thinks alike, everyone is likely to be wrong. CSInvesting: Humphrey Neill wasn’t advising to blindly go against the “crowd” but to think things through rationally. For example, investors might be excited by the new invention of the air conditioner, but the second-order effects were more powerful like increase in demand for real estate in Southern cities in the USA. Has Apple (AAPL) Stock Peaked? With more than 85 million iPhones sold, $156 billion in annual revenues and a market capitalization that recently hit $660 billion, Apple is the second most respected brand on the planet. Number one is Coca-Cola. But what does that mean for investors? It means there’s a chance that investor perception of the company is so high that all the big investors already own as much Apple as they can carry. It means there’s more potential selling pressure on Apple’s stock than buying pressure. And that means there’s a good chance the stock has topped! Now, some investors, looking at numbers alone, will disagree. But using numbers alone is a mistake in evaluating growth stocks, particularly exceptional growth stocks like Apple. For example, we at Cabot did very well recommending Amazon.com way back when the company (selling only books) was still unprofitable, and most bean-counters wouldn’t touch it with a 10-foot pole. We jumped on little Crocs (plastic shoes!) and rode it to the moon. And we did very well with ridiculously “expensive” First Solar, in part because we sold early, while its business was still booming, but its stock was on the skids. We could have justified owning none of those stocks if all we looked at were numbers. Bottom line: to make money in exceptional growth stocks, you can’t just look at numbers; you’ve also got to look at momentum and sentiment. But before I get deeper into Apple’s case, I want you to study this long-term chart of Coca-Cola (KO–see above) (the number one brand in the world today), spanning the years from 1965 to the end of 1985. See at the top of this article.Note the earnings line, with each dot marking a quarterly earnings figure. It’s a steady uptrend, with the exception of a sharp dip in late 1974 and a stumble in 1981-1982. Then look at the dividend line; Coke’s dividends were increased every year, like clockwork. Finally, observe the price line, noting that Coke’s price peaked in late 1972 and didn’t exceed that level until late 1985, 13 years later. The explanation for those “lost 13 years” lies not in the numbers; it lies in crowd psychology, and specifically, in the investing environment of the times. Coca-Cola was one of the Nifty Fifty, popularly regarded as one-decision stocks that you would simply buy and hold forever. (Others in this august group included Digital Equipment, Eastman Kodak, J.C. Penney and Simplicity Pattern). Well, for investors who truly had the patience and guts to hold Coke through those lost 13 years, it worked out okay. But most investors don’t work with that kind of time horizon. Most investors can’t hold five years without seeing a profit—and they shouldn’t have to! The truth is, the extreme popularity of those stocks (call it reverence, even), was a sign of their potential to top. But it was very hard for investors to see it then! So, getting back to Apple, I’ve already mentioned the stock’s high regard among the general public; it’s the number two brand in the world. Among institutional investors, it’s regarded as royalty, providing both a dividend and spectacular growth. In fact, if you manage institutional money, owning AAPL has become almost a requirement in recent years, and the result of all that buying power is that even after the recent correction, AAPL is still up 45% for the year! But when everyone who might buy a stock has bought it, what happens? The same thing that happened to Coca-Cola in 1972. It stops going up, and to some extent—every stock is different—it goes down. Now, I have no doubt that Apple (the company) will continue to grow revenues and earnings for years to come. I’ve been an Apple user since 1987, when I bought a Macintosh SE for Cabot (to join our IBM Displaywriter—Google that!). Today I use a MacBook Pro, an iPad and an iPhone on a daily basis, and I expect to be an Apple user to the day I die, benefiting from the company’s legendary ability to make complicated technological interactions simple. Nevertheless, I’m bearish on Apple (AAPL) stock today and here’s why. There’s a dirty word to describe what happens when a company’s growth slows, and when the perception of the company’s future becomes just slightly tarnished. As that word spreads, and as those perceptions spread, the stock slowly collapses, as the supply of stock (potential sellers) overwhelms demand (potential buyers). The word is deceleration, which is a fancy phrase for slowing down. And Apple is decelerating! That third quarter earnings growth of 23% followed second quarter earnings growth of 20%. Those were the slowest quarters since mid-2009! And looking forward, the projected 12% growth in 2013 is even slower, though 18% for 2014 provides hope. Now, 12% growth is nothing to sneeze at; many companies would kill for 12% growth. And 18% is excellent! But it’s quite a comedown from the nine consecutive quarters from 2010 into 2012 where Apple’s earnings grew more than 50%! It’s deceleration. And that brings us to the stock’s performance, which is where the rubber meets the road. Because more important than numbers, more important than sentiment, is the stock’s actual performance. 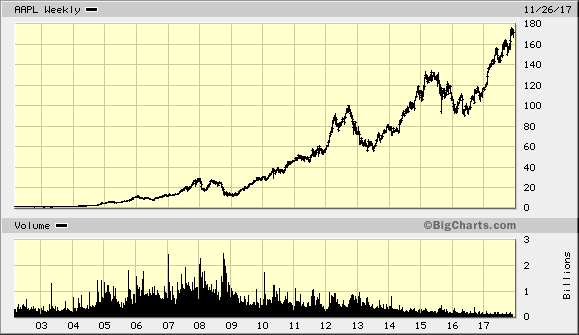 So here’s Apple’s chart, since the 2009 bottom. As on Coke’s chart, you see the earnings line, trending higher, but rounding somewhat recently; that’s the deceleration of earnings. There’s no dividend line on this chart; Apple’s dividend history is short but healthy. But there is another line on this chart and that’s the RP line. RP stands for Relative Performance; it depicts the performance of the stock relative to the broad market. 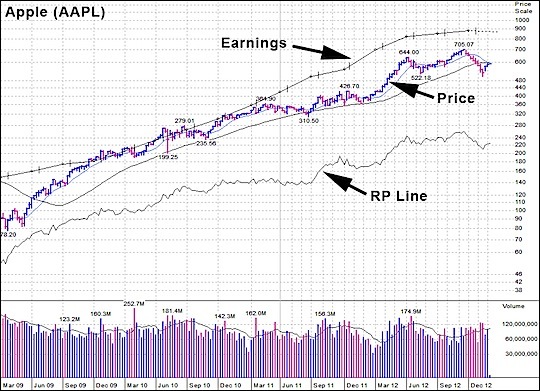 Note that over the past four years, whenever AAPL corrected, its RP line basically flattened out (ignoring the tiny weekly movements). But in this year’s correction, AAPL’s RP line turned down, and for eight weeks, AAPL performed worse than the overall market. Now, this underperformance alone is not the kiss of death. Many stocks can pull out of similar corrections and move out to new highs. But look back at Coke’s chart. If you look at the RP line, you’ll see the same pattern! 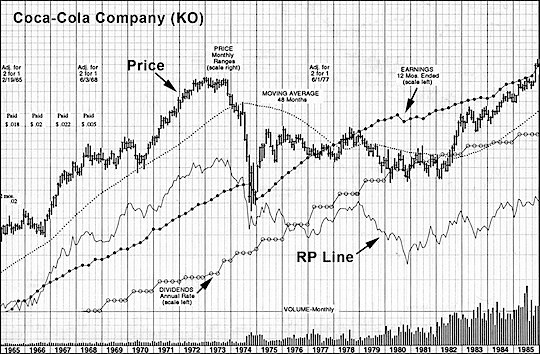 From 1964 through 1973, KO was pretty healthy, beating the broad market overall, and holding its own in corrections. But after 1973, as sentiment turned, and the selling pressures slowly overwhelmed buying pressures, KO’s RP turned clearly negative, beginning a pattern that lasted many years longer than most investors could stomach. And that’s very likely where AAPL is today. Now, big, well-respected stocks don’t collapse overnight. To the contrary; when a high-quality stock like Apple pulls back, you’ll hear a new chorus of “It’s a great value down here” and “Buy the dips.” But as time goes by, and the stock fails to return to its old highs, those choruses fade, and the stock falls slowly out of the limelight—just like Coca-Cola did in the 1970s. Stepping back to look at the big picture, it’s worth remembering that investing is not a science. Uncertainty is a given. 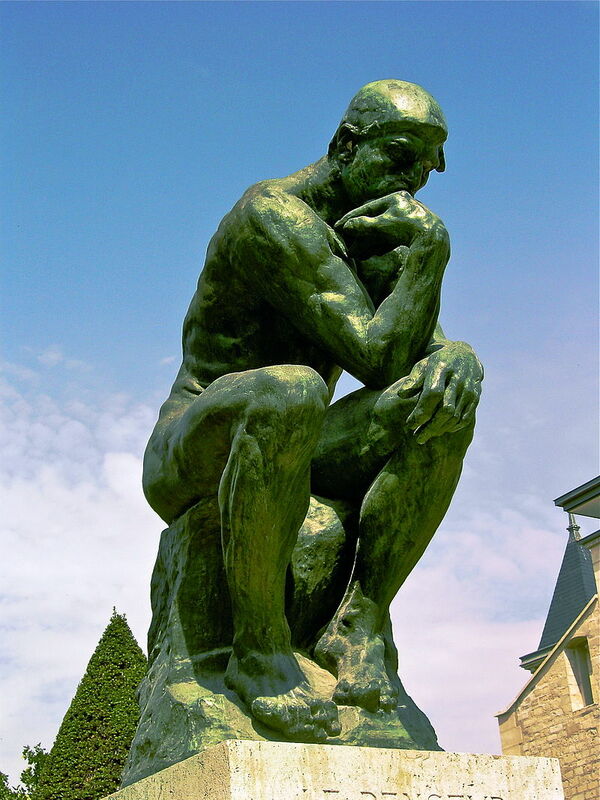 ALAS, NEVER CEASE TO DO YOUR OWN THINKING. A long-term durable competitive advantage in a stable industry is what we seek in a business. I look for businesses in which I think I can predict what they are going to be like in ten to fifteen years’ time. Take Wrigley’s chewing gum. I don’t think the Internet is going to change how people chew gum. Predictable products equal predictable profits. It seems Buffett loves OLD, ESTABLISHED companies. Note the proclivity in his private life to repeat what he likes—burgers and Cherry Coke with Sees’ Candies frenzy as desert. We are studying competitive analysis in case studies to help us determine the strength and durability of a company’s future cash flows (depth and width of moat). Eventually we will circle back to tie franchise analysis in with valuation. Warren Buffett selectively buys stocks when others are rushing to sell. And he has cash when others don’t as in 1973/74 thanks to his closing up his investment partnership in 1969. When Berkshire had $37 billion in cash, he pounced during the crash of 2008/2009. Year Coke JNJ Ford Adv. Micro Dev. Now, the charts do not imply that purchasing a franchise company at any price is wise, but look how profitable growth puts time on your side vs. the non-franchse companies. When the market crashes, Buffett isn’t buying the Grahamian bargain he cut his investing teeth on. Instead, he is focusing on the exceptional businesses–the ones with a durable competitive advantage (DCA). Remember today is Friday the 13th; be careful. The art of investment has one characteristic that is not generally appreciated. A credible, if unspectacular, result can be achieved by the lay investor with a minimum of effort and capability; but to improve this easily attainable standard requires much application and more than a trace of wisdom. — Ben Graham, The Intelligent Investor. It’s not supposed to be easy. Anyone who finds it easy is stupid. — Charlie Munger. Please use the link below to read this lecture on Moody’s. You will learn how a great investor used Buffett’s purchase of Coke in 1988 to make a case for buying Moody’s in 2000 at a high multiple (21) of earnings. Note how this Great Investor is focused on quality companies. You will not learn in business school his creative comparison of two companies at different times and in different industries. Note Buffett’s approach to analyzing Coke and P&G. What does he ignore versus what is important. Write down what you learn from this lecture and how you will apply those lessons to your own investing. I am still learning from this lecture even after my 27th reading. Hey, I am slow!